The dandified Archon's apprentice is literally bowled over by beautiful Emmlyn Podarke -- she knocks him flat and steals his credentials, daring him to pursue her to a remote and mostly forgotten corner of Old Earth. Now Filidor must cope with philosophical pirates, prophet-seeking aliens, light-fingered mummers, and a tiny, bothersome voice in his left ear. Meanwhile, the Archon may or may not have been kidnapped, and somebody's digging up a mysterious ancient artifact buried on the Podarke family farm. 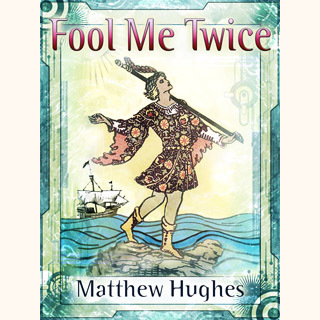 You can read an excerpt from Fool Me Twice here. You can purchase these electronic editions in several formats: mobi (for Kindles and some other readers), ePub (for iPads, Nooks and many other readers), and PDF, which is readable by almost anything else. Once you've downloaded a book you'll need to copy it to your reading device. If you aren't sure how to do that you can refer to these instructions for the Kindle, the Nook, and the iPad.